Carrying EVERYTHING from the classics to today's newest collection of Firearms. Serving the community on the same corner for the last 35 years! At Shooters Service, you’ll find all the shooting sports and hunting accessories you’ll need under one roof. 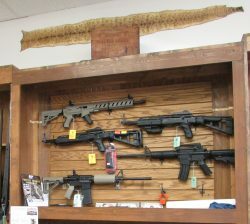 We’re your destination to buy and sell firearms, and we also welcome trade-ins on guns and accessories. Need gun repairs? We offer gunsmith services too! Stop by today and let us take care of your firearm and ammunition needs. Whether you shoot for sport or collect firearms as a hobby, Shooters Service welcomes you! We’re the most complete gun shop in Detroit, MI, catering to your every need. Whether you’re stocking up on ammunition, browsing for accessories, buying a new firearm or looking to part ways with an old weapon, our shop is ready to do business with you. We take pride in more than 30 years of experience and always make time to consult one-on-one with our customers, to make sure we’re meeting their needs. From experienced shooters to first-time gun owners, all are welcome here. More than just a firearm and gun accessory store in Detroit, MI, we also have a professional gunsmith employed. If there’s a problem with your firearm, bring it in to us for service and repairs. We’ll make sure it shoots straight and true before giving it back to you. We’re also the only destination for gun trade-ins! If you’re looking to upgrade and want to safely and responsibly unload your old handgun, stop by our shop. We’ll buy it from you and apply a discount to the purchase of your next firearm. Or, if you want to buy economically, we have pre-owned firearms for sale from a huge variety of manufacturers! Whatever your shooting needs, we’re here to meet them. We’re your destination for firearm trade-ins—a service that’s exclusive to our shop! Our ever-changing inventory includes brand-name firearms from a huge number of trusted industry manufacturers. All of the used firearms we sell are certified in very good to excellent condition, and carry a full 1-year warranty. We employ a licensed gunsmith with more than 30 years of hands-on professional experience. We offer FFL transfers to and from our store, with the experience and contacts to make your online transaction safe and trouble free! Whether you’re in the buying market for a new handgun or looking to trade in an old rifle, Shooters Service welcomes your business. Stop in today to buy, sell or trade with confidence. Shooters Service was started by our Founder Robert Pattison in 1975. “Bob” started in the gun business by representing the L-Tronic night sight and selling AMT firearms. 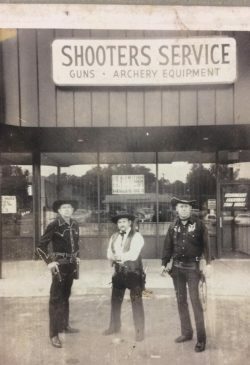 The L-Tronic was the first law enforcement night site system.In 1977 Shooters Service opened it’s first retail location which, was located on Eight Mile Road in Livonia, Michigan. In 1981 the store was relocated to our present location near the corner of Six Mile Road and Middlebelt Roads in Livonia, Michigan. For the last twenty years we have operated one of the Metro Detroit Area’s finest and largest specialty firearms and archery stores around. Currently the store is owned and operated by Roger Little, President and General Manager. Our main asset is you the customer. A close second is our experienced and knowledgeable staff. Most of our staff has ten to twenty years each in the gun business. Shooters Service carries only top brand merchandise from quality manufacturers. We stand behind the products we sell and provide excellent service. If you are currently one of our many valued customers, you’re already aware of our excellent customer service. If you’re not one of our valued customers, give us a visit and we think you’ll soon be one.